Government-provided services are caught in the jaws of a ‘cost-tax vice’. On the cost side, the long-term trend of rising relative prices of services, including education, seems set to continue. The other jaw of the vice is the high efficiency cost of raising additional taxes. Recent research making the case for public provision of post-compulsory education has concentrated on the difficult task of quantifying its economic and social benefits. 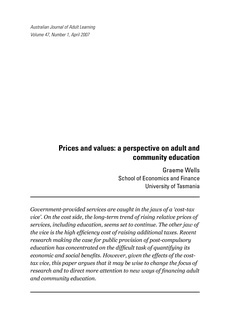 However, given the effects of the costtax vice, this paper argues that it may be wise to change the focus of research and to direct more attention to new ways of financing adult and community education.